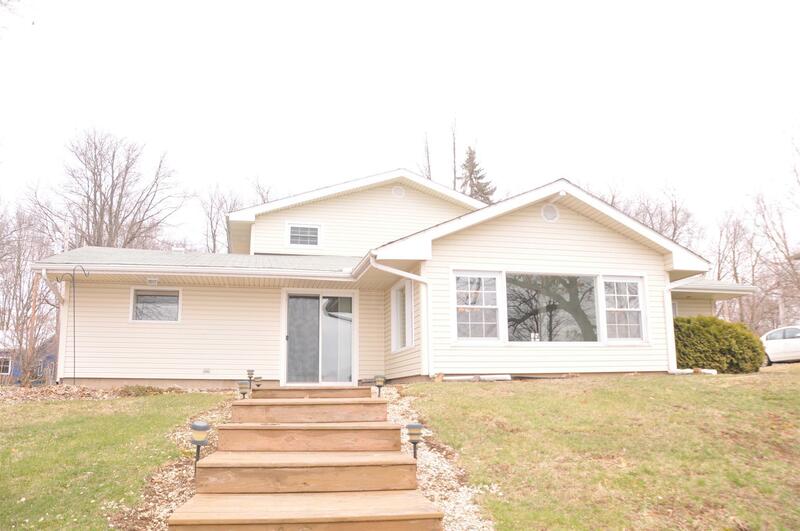 BEAUTIFUL WATERFRONT VIEWS OF LAWRENCE LAKE WITH +/- 67&apos; LAKEFRONT PROPERTY! This lovely 6 Bed, 2 Bath home has lots of windows and a wonderful Sunroom to let you enjoy hours of relaxation while you gaze out at the peaceful water. The cozy Living Room features a gas log fireplace and has just been freshly painted. The Kitchen has been painted as well, has lots of countertop space, and opens up to the Dining Room. There is also a den on the main level that walks outside to the patio and lakefront area, along with two bedrooms, a full bath and a main floor laundry. Four more bedrooms are upstairs and another full bath. Lots of extra room for all of your guests to come enjoy the lake with you! An extra lot across the street is also included with this home and would be a perfect place to add a large garage or pole barn to hold your boat and lake toys, or would be a great spot for children to play as well. Pier and kitchen appliances included and all bedroom furniture negotiable. 1 yr Home Warranty Included! Located 2 hours from Chicago and Indy and 1 hour from the Granger area. Call for your private tour today so you have time to enjoy the lake for the Summer!